Tag line: "All guns. 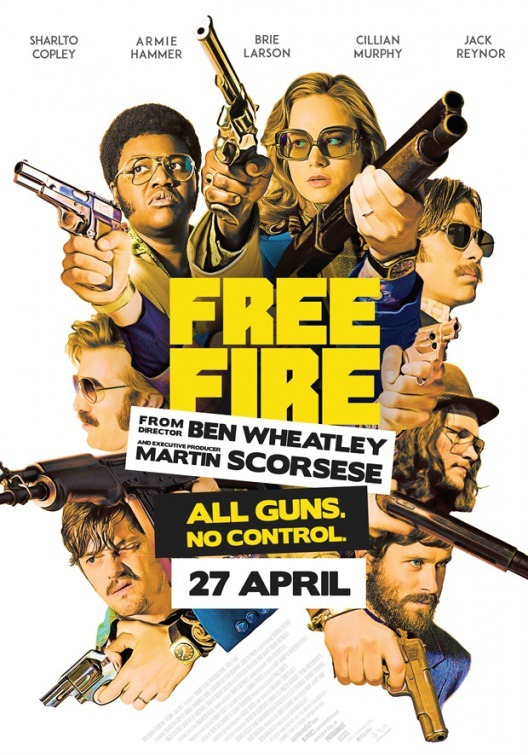 No control"
Certain things grab my attention, and in the case of Free Fire it was the little snippet on the Blu-Ray cover that one of its executive producers was Martin Scorsese. For me, Scorsese is the consummate cinephile, and the fact that this 2016 film bears his name was enough to convince me it was worth checking out. The setting is 1970s Boston. Chris (Cillian Murphy) and Frank (Michael Smiley) are trying to secure weapons for the Irish Republican Army. With the help of Justine (Brie Larson) they’ve arranged a meeting with Vernon (Sharito Copley), a wealthy South African arms dealer who has agreed to sell them a shipment of M-16 assault rifles. Both parties meet late one evening in an abandoned warehouse to make the exchange. To help move the rifles, Chris and Frank have brought along Stevo (Sam Riley), Frank’s drug-addicted brother-in-law; and Stevo’s friend Bernie (Enzo Cilenti). As for Vernon, he’s joined by his partner Martin (Babou Ceasay), a couple of hired guns (Jack Raynor and Noah Taylor), and the smooth-talking Ord (Armie Hammer), who will act as mediator. Tensions flare up temporarily when Chris and Frank discover Vernon has changed the deal on them (he’s brought AK-47s instead of M-16s), but just when it looks as if things are calming down, the negotiations take an unexpected turn. Minutes later, guns are blazing, and with hundreds of bullets flying in such a confined space, odds are that very few of the combatants will make it out of this unfortunate predicament alive. 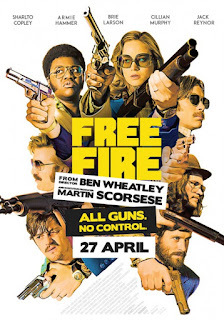 The creative team behind Free Fire did an outstanding job capturing the look and feel of the 1970s, from the polyester-rich clothes right down to the musical soundtrack (I’ll never hear John Denver’s “Annie’s Song” again without thinking of this movie). As for the cast, it’s tempting to try and select one or two "standout" performances; Sharito Copley is hilarious as the megalomaniacal Vernon, as is Gillian Murphy as the hard-nosed Irishman who - in every situation - refuses to back down. Armie Hammer is also good as the wise-cracking Ord, and Brie Larson holds her own surrounded by what is otherwise an all-male cast. But the fact of the matter is that Free Fire is a true ensemble piece. Every performer shines, and whether you like their character or hate them (Sam Riley’s Stevo is a slimeball), not a one is boring. Though it takes place in a single setting, Free Fire manages to maintain a consistent level of intensity throughout, and the smart, witty screenplay co-written by Amy Jump and director Ben Wheatley is a key reason why (along with the action, the film is damn funny, and features plenty of dialogue that will have you laughing out loud). Loaded with humor and excitement, Free Fire is the kind of movie Martin Scorsese himself turns out on a regular basis. And that is no faint praise.